Besant Technologies takes pride in stating that it offers the best Robotic Process Automation	Training in Chennai. What make our course even more valuable are the faculty members that impart the lessons; they are expert professionals and have tremendous theoretical and empirical knowledge. The instructors have years of experience of working in MNCs, dealing in Robotic Process Automation and related technologies. What sets us apart is the fact that we offer Robotic Process Automation Training in Chennai in a practical manner, as per industry needs and standards. The range of services provided by our esteemed team of trainers includes Robotic Process Automation Corporate Training services, Robotic Process Automation Online Training as well as Robotic Process Automation in Classroom training. Our syllabus has been designed in a way to meet real world requirements, not just to suit the beginner level students but also for those looking to receive advanced level training. The training that we provide is also very flexible in that it is made available on weekdays as well as weekends based on the demand and convenience of the candidates. 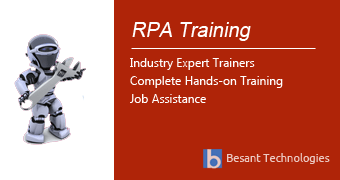 Besant technologies Offers Best RPA Training in Chennai with Certified Experts. Get Practical Knowledge on RPA Tools like Blue Prism, UI Path, Automation Anywhere and Openspan in Chennai. With the advent of technology, web developers and designers are the hard rock of any company or organization. The technology has hit a new age of innovations, and so has the demand for web developers, programmers or web designers. This golden era of technology has signalled business growth and an economic boost too. The Robotic Process automation (RPA) is an emerging form of automation of business. There is a huge demand for RPA developers in the IT world today. To be a part of the robotic world, it is essential to get the right training and acquisition of skills. Besant Technologies is the best stop to get the best RPA training in Chennai. RPA Training Classes Venue:- RPA Courses are run in our Chennai training centers (Velachery, Tambaram, OMR, Anna Nagar, T Nagar, Thiruvanmiyur, Adyar, Porur, Maraimalai Nagar and Siruseri). If you are looking for Best RPA Coaching Center in Chennai please contact 9962528293/4. Robotic Prices Automation is the next big thing in the world of Information Technology. It is all about automating the repetitive tests done by manual labour by replacing the human element. It increases the efficiency and minimizes the mistakes. It also proves to be cost effective in the long run. To stay a step ahead as an RPA process developer it is recommended to join Besant Technologies who strives to provide the best faculty, most reliable study materials, practical-based training and incredible career opportunities in Robotics. Accounting: The companies or organizations may adopt RPA for general accounting. Healthcare: The RPA system can be used for handling patient records, claims, customer support and general accounting tasks. Supply chain management systems- It can be adopted for procurement, automation of order processing and payments. There are few institutions providing RPA training in Chennai. Besant Technologies is one of the leading institutions which offer RPA training to the aspirants with top faculty. This is the next big revolution of technology which promises an excellent career growth. Besant Technologies delivers the best classroom training, lab facilities, faculty who are experts from the industry, real-time projects under the mentorship of the industry experts and the most reliable study materials to help you excel in developing and designing the RPA system. The aspirants undergo practical training to increase their command on the software tools. The students are required to work on real-time projects to enhance their skills, provide great exposure as well as boost their confidence. The faculty consists of deemed experts from the industry. A globally accredited certified course is provided to the students from the leading institute of Chennai Besant Technologies. Our trainers are expert professionals from the IT industry. They possess great communication skills, engaging personality and immense experience in the world of Information Technology. They possess up-to-date knowledge of the latest innovations and software tools in the Information technology industry. Our trainers believe in quality learning. The course curriculum is designed by the highly experienced and knowledgeable faculty of Besant Technologies to meet the needs of the industry. The trainers not only aim to bring our RPA expert developers but also impart great communication skills, and enthralling personality which is also very essential in the corporate world. The certification by Besant Technologies gives the aspirants a professional credential. The certificates are accredited globally by all IT Industry Company and organizations. During the course, the aspirants are given aptitude training as well as mock interviews to prepare them for an interview in the real world of IT and get placed successfully. Besant Technologies has placed more than 2000 students successfully in lucrative job positions as RPA experts. Since, we are focused on imparting a One-to-One Robotic Process Automation Training in Chennai, our trainees get to acquire a lot from the course. Our Fast-Track Robotic Process Automation Training in Chennai also ensures that they learn the most within the least possible time. Here are the RPA Training Classes in Chennai Schedule in our branches. If this schedule doesn't match please let us know. We will try to arrange appropriate timings based on your interest. Mentors train RPA in Chennai not only to assist students in implementing live projects, but also to hold a preparatory session for the interview along with community outreach. Besant Technologies branches in Chennai are listed above. And most popular locations where students / professionals are in just few Kilometers away from below mentioned locations lining up to get RPA training with us.